Participants in the current debate about the literary canon generally separate the established literary order—of which Shakespeare is the most visible icon—from the emergent minority literatures. In this challenging study, Peter Erickson insists on bringing the two realms together. He asks: what impact does a revision of the literary canon have on Shakespeare's status? Part One of his book is about Shakespeare on women. In analyses of several Shakespearean works, Erickson discusses Shakespeare's ambivalence about women as a reflection of male anxiety about the cultural authority of Queen Elizabeth. Part Two is about (contemporary) women on Shakespeare. Erickson discusses Adrienne Rich's revision of the very concept of canon and discusses how several African-American women writers (in particular Maya Angelou and Gloria Naylor) have reflected on the ambivalent status of Shakespeare in their worlds. Erickson here offers a model for multicultural literary criticism and a new conceptual framework with which to discuss issues of identity politics. Rewriting Shakespeare, Rewriting Ourselves makes an important contribution to the national debate about educational policy in the humanities. 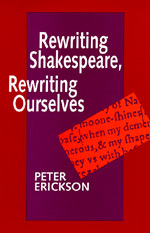 Peter Erickson is the author of Patriarchal Structures in Shakespeare's Drama (California, 1985) and co-editor with Coppélia Kahn of Shakespeare's "Rough Magic": Renaissance Essays in Honor of C. L. Barber (1985). He is currently writing the volume on the comedies for Routledge's series, Feminist Readings of Shakespeare.